Kanwar Yatra Dates based on traditional Hindu calendar followed in North India. In 2019, Kanwar Mela and Yatra begins on July 17 and it ends on August 15 - Shravan Purnima. Kavad Yatra is today of great religious importance in India. In the Hindi Month of Shravan (July – August) millions of Kanwarias, devotees of Lord Shiva, from Indian states of Delhi, Uttar Pradesh, Haryana, Rajasthan, Punjab, Bihar, Jharkhand, Chhattisgarh and Madhya Pradesh make a journey to Haridwar, Gaumukh and Gangotri in Uttarakhand to collect ‘Gangajal’ (holy water from the Ganges) for anointing the Shivling at their respective villages and homes. The holy water they collect from River Ganga is used to bathe Shiva Lingam on Amavasya day in Shravan month or on the Mas Shivratri day. Shravan month is dedicated to Lord Shiva and most people observe a fast on Mondays in Shravan month. 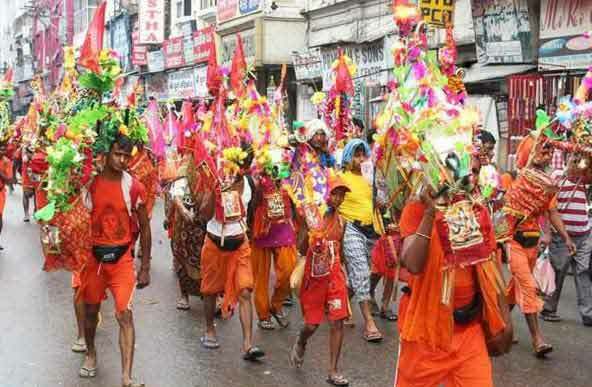 The name Kanwarias comes from the pole the yatris carry called ‘Kanwar’ on their shoulders. Pots with Ganga Water hang from the two sides of the pole. Nearly a million Kanwarias carry Ganga water from Sultanganj – the only place where Ganga flows towards north – to the famous Deoghar Shiva Temple during Shravan Mela. Kanwarias approach the Kanwar Yatra differently. Some prefer to walk the entire stretch from there home to the River Ganges silently chanting prayers. Some go in groups singing the praise of Lord Shiva. Some devotees create a Mela atmosphere by traveling on trucks and carts with loudspeakers playing different types of music. Then there are the relay marathon runners called ‘dak kanwarias.’ In it, each yatri runs a certain distance and is then taken over by another yatri. The Kanwarias that create a Mela like atmosphere make news headlines due to their rowdy behavior and often get into fight with local people and people on road. Government authorities from this year onwards have decided to ban all sort of vehicles in Kanwar Mela that use high decibel music. Numerous Hindu spiritual organizations and other voluntary organizations setup camps along the National Highway during the Kanwar Yatra. The Kanwarias are proved food, shelter and safe place to keep the Ganga water.